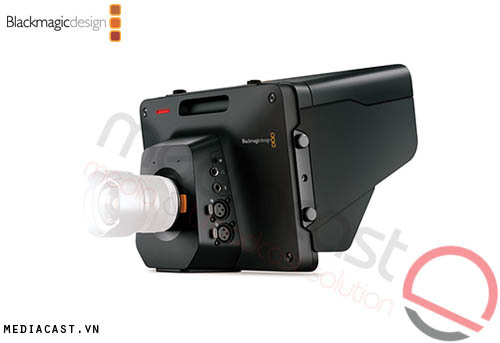 The Blackmagic Studio Camera 4K is a compact and lightweight broadcast camera designed for live production. Constructed from a magnesium alloy body, the camera is light even for travel, yet durable enough for use in the field. It has a large 10" LCD screen with detachable sunshade and an active Micro Four Thirds lens mount for compatibility with a wide range of lenses. The camera also provides features you'd expect to find in larger studio cameras, such as tally indicators, talkback, XLR audio connections, and 12G-SDI and optical fiber video inputs/outputs. ATEM Camera Control Update This update, which will be available as a free download for both the ATEM switchers and Blackmagic Studio Camera, allows for control of the camera from any ATEM production switcher. It works by sending the camera control commands down the SDI program feed to the camera and lets you adjust focus, iris, gain, and more. Blackmagic has also taken the primary color corrector from DaVinci Resolve and built it into the camera, which can be controlled from the ATEM switcher. This means you can control a full primary color corrector from the camera itself, letting you do more creative corrections than simple color balancing.